Every now and then, I need a sweet romance. I need a book that will send my heart all a fluttering, like it’s filled with a million butterflies. 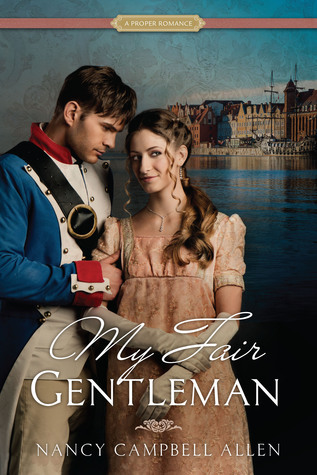 My Fair Gentleman was just that book. I was swooning and smiling the whole time. There may have even been a tear or two. From the first moment I laid eyes on Jack, my heart was smitten. I could tell that he has lived so many years with the hurt of being disowned by his grandfather, it’s taken it’s toll on him. He puts up this strong front, but if you look close, you could see the cracks inside. He did everything he could, for his mom and sister. And just when he was about to set sail on his very own ship, his life was flipped and he was forced to change everything to protect them. Ivy is doing a favor for her grandmother. She needs to help Jack and is family get reacquainted with a life they should’ve always been leading. Teaching women to be gentile? No problem. But turning a sailor into a gentleman, well that may prove a bit troublesome. Jack and Ivy were so much fun to watch. She is used to a certain level of decorum. But being around Jack, she realizes that decorum is sometimes overrated. They make each other laugh, which is not normal. He teaches her to relax a bit, and in doing so, her heart starts to fall. But she knows she can’t do anything, for he is an earl who needs to find a bride. A bride that isn’t her. Not everything went as smooth as they’d hoped, but they were there for each other. Watching these two care for each other, in their times of need, was beautiful. To see their feelings grow was perfect. She knew she couldn’t have him, but it’s hard to tell your heart to stop. I wanted to whisper in her ear and tell her that it’s going to be ok, if she just stopped and really listened. I am a HUGE fan of these Proper Romance books. They are not specifically Christian themed books, but they are very clean. I have read a few in the PR family and have greatly enjoyed them. In fact, my 14 yr old is a huge fan also, and she isn’t one for romance. The difference about these romance books is that the romance itself isn’t overpowering. It’s slow and innocent and not uncomfortable. Whether you’re a reader of romance or just looking for a clean story to recommend to teens, this book, among the rest of the Proper Romance stories, are right up your alley.